Welcome to Foodie Friday Link Party 76! I’m so glad you’re here. 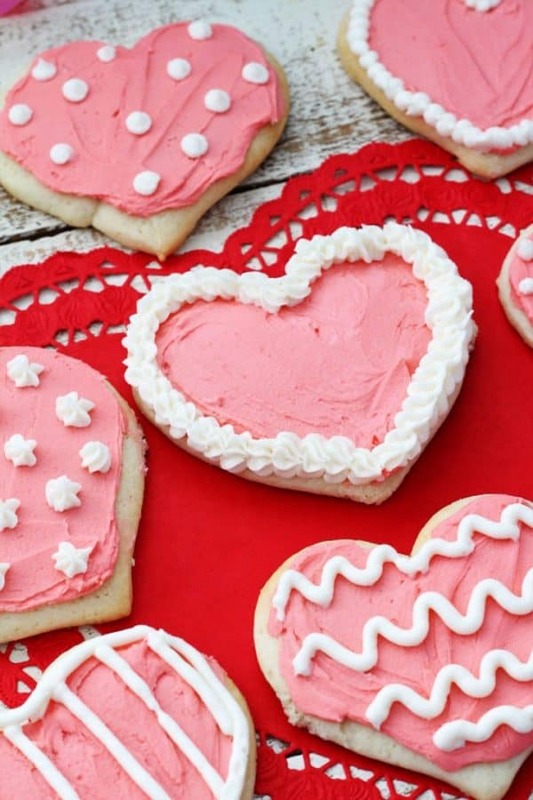 Valentine’s Day is right around the corner and we have some great recipes from foodie blogs around the web. I thought this week’s Foodie Friday could center around all of those delicious Valentine gift ideas with food. It really doesn’t get better than that. This first recipe just oozes comfort and goodness. I love the gingham setup, which makes for a wonderful treat for your loved one on Valentine’s Day to come home to. And this pound cake is such a scrumptious dessert any time of year, but especially this month. 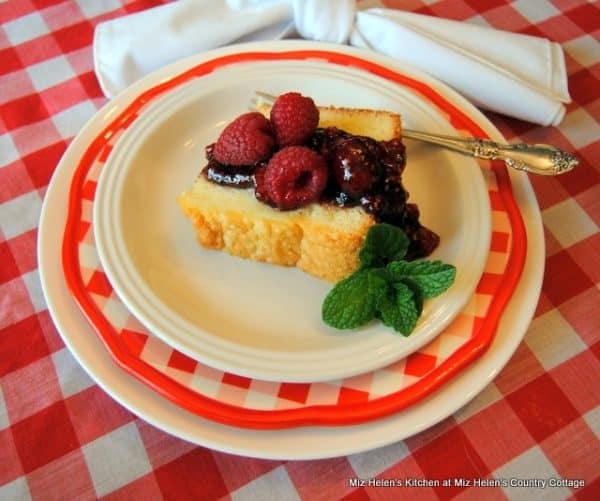 Add Miz Helen’s raspberry sauce on top of her recipe and you’ve got yourself a rich and decadent dessert. Sugar cookies with a creamy powdered sugar frosting are some of my all-time favorites. Add some different colored frosting and a little decor right on top and you have a fun gift for your loved ones. The kids will love making these cookies almost as much as they love eating them. I love this next treat because it’s so simple to make and turns out so pretty. One of my friends made this recipe and I couldn’t stop eating it–the combination of salty and sweet was hard to put down. 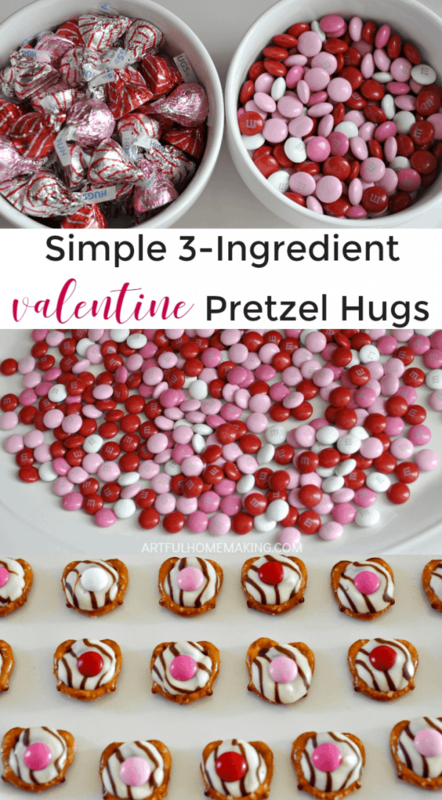 The Valentine recipe calls for just three ingredients–Hershey Kisses, M&Ms, and pretzels–and a few minutes of your time. You’ll get a special snack that’s perfect for your loved ones, kids at school, teachers, or anyone you’d like to share with. Amy, over at The Speedy Spatula, was right when she said, “Nothing says ‘party’ quite like a hot, chewy, cookie straight out of the oven with a tall glass of cold milk.” Now that is happiness. Amy shares her easy M&M cookie recipe so you can have these whipped up for the kids or your honey in no time. Plus, she has a secret ingredient that always makes cookies taste amazing. I love brownies, but I also love blondies. I don’t think they always get their due. 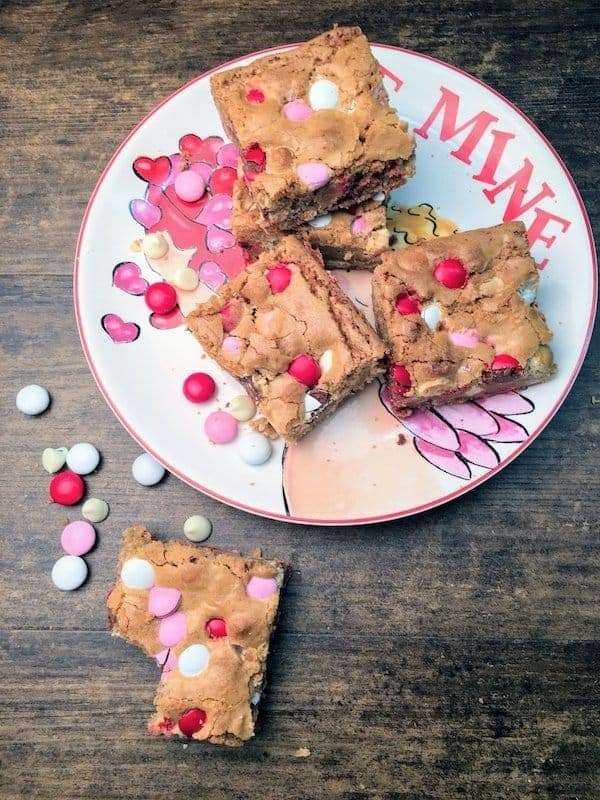 Blondies are a sweet treat that you can jazz up with some candy. In this case, I added M&Ms for a yummy Valentine treat. They are easy to make and come out chewy and pretty darn good. 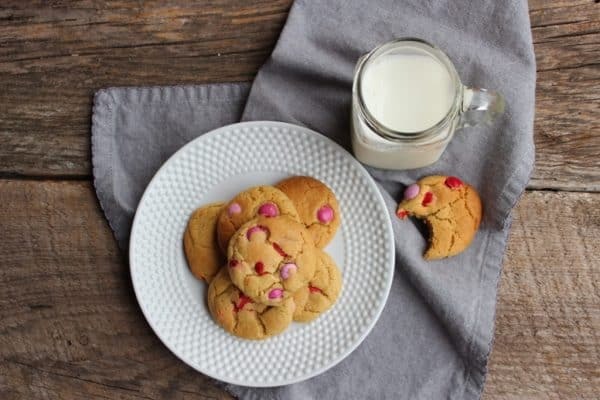 Thanks so much for featuring my Valentine M&M Cookies! Hope you have a wonderful weekend! Hi Amy! They look SOOOO yummy!! Thanks for sharing! Hi Marilyn! Thanks for stopping by and always sharing great recipes! Thank you so much for featuring our Sugar Cookies. That was fun. Thank you too for hosting the party. Happy Valentine’s Day! Hi Amy! You’re welcome! They look absolutely delish!! Thanks for sharing! Thanks so much for the great feature for my Vintage Sour Cream Pound Cake with Raspberry Sauce, this is such a nice surprise, I really appreciate it! Hope you have a great week and thanks so much for the party! Hi Miz Helen! You’re welcome. It looks AMAZING! 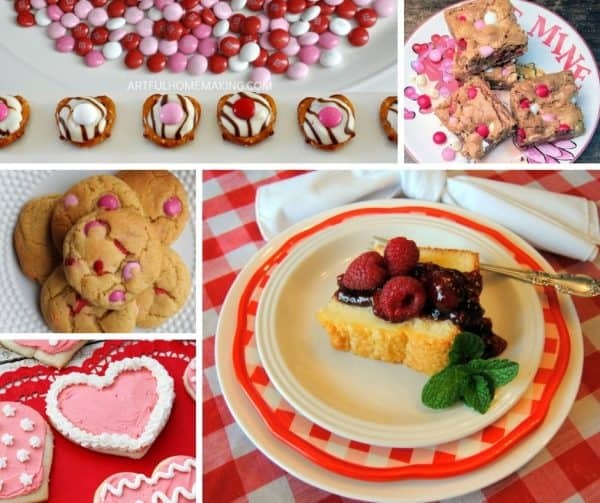 Julie, thank you for hosting and for featuring my 3-Ingredient Valentine’s Treats! Have a lovely weekend! Hi Joy! Love your recipe. Thanks for sharing it with us! WOW! So many wonderful ideas! Thank you so much for sharing, I can not wait for Valentine’s Day. This year I will be the fun grandma. Thank you, thank you!!!!! Love it! I bet you are already the fun grandma! Hi Mareliz! Thanks so much for sharing your wonderful recipes! !